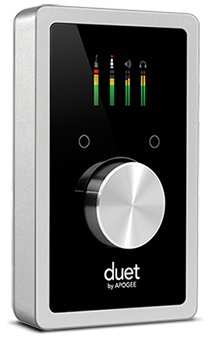 "We are blown away by the quality of the Apogee Duet. The device itself is solid and well built." "This is the best quality audio interface I've yet come across by quite a wide margin." "Other interfaces I’ve used in the past take days-even weeks-to get comfortable with; however, I’m only 30 minutes into my first go with a Duet, and we already feel like old friends." "In short, the Duet truly is a professional level audio interface. But it’s more than that; it’s somewhat future-proofing yourself. If we’re truly entering the post-PC era, then it’s time that we take our mobile devices seriously as equipment that is completely capable of (and in many cases preferred) producing incredible results that we’ve previously only seen in desktop machines. The Duet makes this possible, and right now it’s the only machine on the market of its caliber." "The Duet for iPad & Mac gives you your money's worth, thanks to its beautifully detailed audio quality, software integration, and ease of operation; you almost can't put a price tag on this level of performance." "The device just works, works well and with its intuitive design and diminutive form factor, its not in the way - literally or figuratively. What I find most compelling about Duet for iPad and Mac, however, is the utility, and the ability to leverage one investment across multiple use cases. I'm planning to keep Apogee's breakout box connected and wired up on my desktop studio Mac, while using the "octopus-style" breakout cable for mobile use on both my MacBook Pro, and iPad. While the Duet represents true investment in your music making (with a street price of around $650), the ability to easily move the compact, lightweight "brains" of the system around amortizes the cost across three different work environments, letting me get creative literally anytime, anywhere. And with its awesome specs and performance, it ensures professional results no matter which approach I'm taking." "The Duet for iPad & Mac interface is Apogee’s latest step towards bringing its renowned sound to those outside the world of professional recording studios, streamlining everything that has made Apogee products an industry standard into a more compact, portable, and affordable package, and now complete with full MIDI functionality and the ability to work directly with an iPad or iPhone." "The Duet 2 was a good bet for Mac, so this new Duet has become a great choice if you want an interface with independent headphone and speaker outputs that will support capture and playback of high-quality audio from both your Mac and your iOS device."